My NIV doesn’t have John 5:4. But the story doesn’t make the same sense without it. There’s a whole new level when you add in WHY the people came to this pool. I don’t know why some manuscripts have this verse and others don’t. 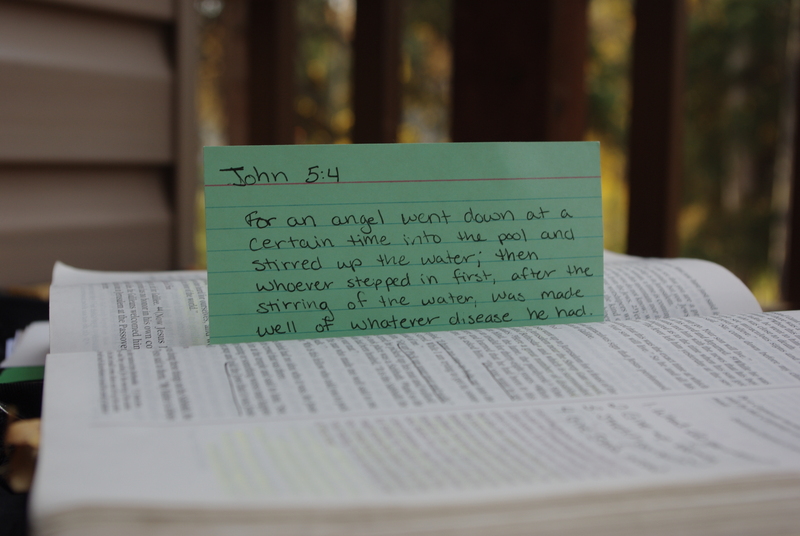 But, I keep this index card tucked in my bible to remind me that there is some human element in the bible. God is big enough to protect His Word. But somehow, we play a role too. I don’t understand it. Not fully. Not yet. Because there is also 1 Corinthians 13:12. MamaPsalmist is very seriously under construction. Eventually, I'll decide what layout I want to use and then make a background and header that fit. For now, you can watch as I slide and wiggle the pieces into place. It's like, modern art or something.